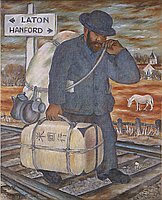 Focal point of image is a bearded Japanese man wearing hat and dull blue buttoned suit over blue shirt walking on railroad tracks toward Hanford, right. He holds a tied white rectangular bundle with kanji, "Beikoku yuki" (going to America), by handle in right hand as he carries a large white bundle strapped across his back; coffee pot, pan, and cup hangs from rope around bundle. A piece of paper protrudes from one pocket while the other bulges with some object. 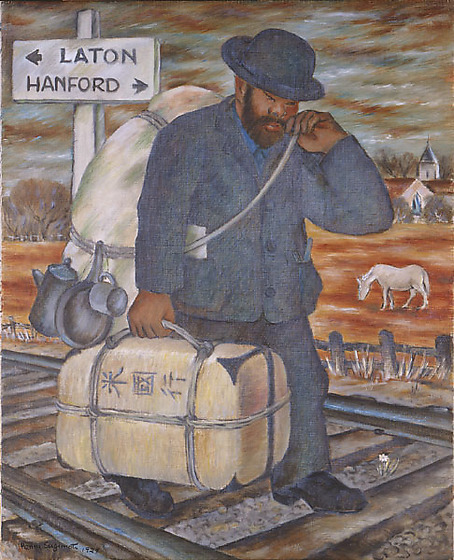 Behind him, in upper left corner, a white road sign indicates directions to Laton and Hanford. A short distance away, a fence runs parallel to the tracks. At midground a white horse grazes on reddish tan ground. In the far distance right, a religious statue stands before a church. Trees line the horizon under a dark, overcast sky.